WASHINGTON The beautiful landscape and teeming wildlife of the Sonoran Desert will come to life on the nations cards and letters next month when ten new commemorative stamps are issued April 6 by the U.S. Postal Service at the ArizonaSonora Desert Museum in Tucson, Ariz.
"The Sonoran Desert pane of stamps colorfully depicts 25 plants and animals common to one of North Americas most spectacular biomes," said M. Richard Porras, Chief Financial Officer and Senior Vice President of the Postal Service, who will dedicate the stamps at a 10 a.m. ceremony. "These stamps will help promote a greater appreciation for the diversity and beauty of our desert lands, and serve as a nature lesson for the enjoyment of young and old alike," said Porras. The Sonoran Desert stamp pane establishes two firsts for commemorative stamps. It is the first in a newly developed educational series of stamp panes titled "Nature of America," and the first to feature self-adhesive U.S. stamps whose designs are part of a larger illustrative scene. The stamp pane will be available at Tucson-area post offices starting April 6 and at post offices nationwide the following day. Designed by Ethel Kessler of Bethesda, Md., and illustrated by John Dawson of Hilo, Hawaii, the stamp panes desert scene is based on photographs and on research by Professor David E. Brown, a specialist in the classification of biotic communities. 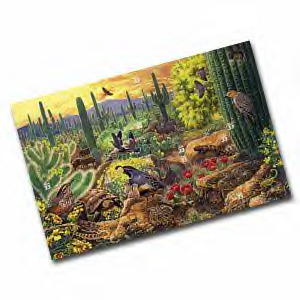 The Sonoran Desert stamp pane depicts a Teddy Bear Cholla, Cactus Wren, Brittlebush, Banded Gecko, Desert Tortoise, Collared Peccary, Tarantula Hawk, Harris Hawk, White-winged Dove, Gambel Quail, Tarantula, Prickly Pear, Saguaro, Desert Mule Deer, Desert Cottontail, Hedgehog Cactus, Cactus Mouse, Western Diamondback Rattlesnake, Gila Monster, Blue Paloverde, Verdin, Elf Owl, Gila Woodpecker, Creosote Bush and Bark Scorpion. Centered in the northern Gulf of California, the Sonoran Desert has a tropic-subtropic climate in which freezing temperatures lasting 24 hours rarely occur. In contrast, the other North American deserts, Great Basin, Mojave and Chihuahuan, are temperate and landlocked. These differences, and the Sonoran Deserts biseasonal rainfall pattern, also make it one of the countrys lushest deserts, populated by giant cacti, short trees and a great variety of shrubbery. Despite high summer temperatures exceeding 110 degrees Fahrenheit, the Sonoran Deserts southern location and moderate winters make for varied plant and animal life.